Then, six days before the Passover, Jesus came to Bethany, where Lazarus was who had been dead, whom He had raised from the dead. There they made Him a supper; and Martha served, but Lazarus was one of those who sat at the table with Him. Then Mary took a pound of very costly oil of spikenard, anointed the feet of Jesus, and wiped His feet with her hair. And the house was filled with the fragrance of the oil. But one of His disciples, Judas Iscariot, Simon’s son, who would betray Him, said, “Why was this fragrant oil not sold for three hundred denarii and given to the poor?” This he said, not that he cared for the poor, but because he was a thief, and had the money box; and he used to take what was put in it. But Jesus said, “Let her alone; she has kept this for the day of My burial. 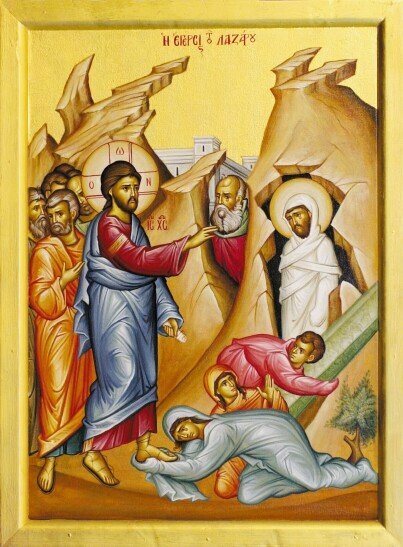 For the poor you have with you always, but Me you do not have always.” Now a great many of the Jews knew that He was there; and they came, not for Jesus’ sake only, but that they might also see Lazarus, whom He had raised from the dead. But the chief priests plotted to put Lazarus to death also, because on account of him many of the Jews went away and believed in Jesus. The next day a great multitude that had come to the feast, when they heard that Jesus was coming to Jerusalem, took branches of palm trees and went out to meet Him, and cried out: “Hosanna! ‘Blessed is He who comes in the name of the Lord!’ The King of Israel!” Then Jesus, when He had found a young donkey, sat on it; as it is written: “Fear not, daughter of Zion; Behold, your King is coming, Sitting on a donkey’s colt.” His disciples did not understand these things at first but when Jesus was glorified, then they remembered that these things were written about Him and that they had done these things to Him. Therefore the people, who were with Him when He called Lazarus out of his tomb and raised him from the dead, bore witness. For this reason the people also met Him, because they heard that He had done this sign. Palm Sunday begins our journey in Holy Week, our journey to the Resurrection of our Lord and Savior Jesus Christ. As we enter this holiest of weeks, we are not just remembering what happened around 2,000 years ago but we are living it today with Christ. As Christ is processing on Palm Sunday, we are there with the palms that symbolize our victory in Christ. As the Jewish people threw down their cloaks for Jesus, we lay down our whole lives. As they cry out “Hosanna” or “Save us,” we, too, cry out the same. But do we abandon Him when He comes not as a king with worldly prosperity but as a suffering servant, suffering for our sakes and calling us to be at His side? What did Mary do to Jesus? What was her motive? How did Judas respond? What was his motive? What is happening in this story? What does this Gospel passage mean for our lives? Palms for Victory—As the palms symbolize victory, have your family make a victory collage. Get a large sheet of poster paper and draw images of victory on it. You can also use magazines to cut out the images and glue them on. Look for quotes from the Bible but also from popular culture that could symbolize Christ’s victory. Be creative and have fun. Discuss the difference between Christian victory and victory in popular culture. When you are done, hang the poster somewhere for all to see during Holy Week. Compare Icons—Visit Come and See Icons (www.comeandseeicons.com) to view the Holy Week icons. Look at each one. Have children identify what they see, what they have questions about, and how the icons differ. Point out the icons to your children as you attend services during Holy Week. Help your children find answers to any questions they may have. Journey with the Lord—As a family, make a plan for your journey with Christ to the Resurrection. Plan to attend as many services of the Church as possible. Also, consider your prayer life at home and how you will prepare yourself and your children to attend the services. In doing this, everyone can be active participants in the Resurrection of our Lord and Savior Jesus Christ. If we cannot attend services every evening, we should still read portions of the scripture and the hymns from the Holy Week book. If you do not have a copy, talk to your parish priest about where you can purchase one. Today He returns from Bethany and proceeds of His own free will toward His holy and blessed passion, to consummate the mystery of salvation … He comes without pomp or ostentation … Let us run to accompany Him as He hastens toward His passion, and imitate those who met Him then, not by covering His path with garments, olive branches or palms, but by doing all we can to prostrate ourselves before Him by being humble and trying to live as He would wish … So let us spread before His feet, not garments or olive branches, which delight the eyes for a few hours and then wither, but ourselves, clothed in His grace, or rather, clothed completely in Him. We who have been baptized into Christ must ourselves be the garments that we spread before Him. Glory to the Father and the Son and the Holy Spirit, both now and forever. Amen. With our souls cleansed and in a spirit carrying branches, with faith let us sing Christ’s praises like the children, crying with a loud voice to the Master: Blessed are You, O Savior, who has come into the world to save Adam from the ancient curse; and in Your love for mankind You have been pleased to become spiritually the new Adam. O Word, who has ordered all things for our good, glory to You. I Saw the Holy Light by Archmandrite Savvas Achilleos—This book is an amazing account of Monk Mitrofanis who guarded the entrance of the life-giving tomb of our Savior in Jerusalem for many years and saw the miraculous Holy Light. Available from Light and Life Publishing. Holy Week Ornament Kit —This kit has seven Holy Week icons on shrink plastic. The icons can be colored and shrink to ornament size when briefly baked in the oven. Available from Padia ( www.padiaclassics.com ). Setting the Example—This article for teenagers focuses on the role of young people in the Church by exploring the faith of the three youths we celebrate on Holy Saturday morning. On the Web site of the Greek Orthodox Archdiocese Department of Youth and Young Adult Ministries (www.youth.goarch.org), select the “Challenge” link. The article can be found in the April 2001 archive.